Expedition 23 astronaut Soichi Noguchi took and shared so many amazing images during his 6-month stay on board the International Space Station, and I was a little worried that his return to Earth would result in a bit of a let-down in the space imaging department. I now see I had nothing to fear: Three new members of the Expedition 24 crew arrived at the ISS late last week and Doug Wheelock seems to have filled Soichi’s shoes (or socks, since they don’t wear shoes on the ISS) quite nicely. He posted two new images today on his Twitpic page that are nothing short of stunning. This image, above of an orbital sunrise provides a great look at the ISS bathed in “morning” light. “A stunning sunrise aboard the International Space Station, as seen from the Russian MRM1 Module. We’re blessed with 16 sunrises each day!” Wheelock, a.k.a Astro_Wheels wrote. See below for an aurora he captured over the South Pole. An aurora seen over the South Pole, from the ISS. Credit: Doug Wheelock, NASA. “A breath-taking masterpiece being painted in the sky over the South Pole. ‘The Southern Lights’…like brush strokes from the Master’s hand…” wrote Wheelock. Follow Wheelock on Twitter to get the latest images he takes during his Expedition. 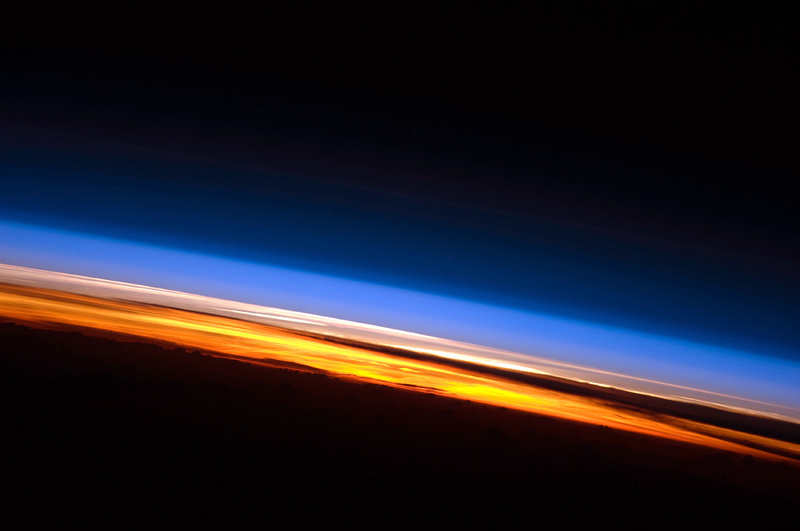 A recent image of a sunset taken from the ISS, is also incredibly beautiful. It wasn’t taken by Wheelock, but made NASA’s Earth Observatory’s website “Image of the Day” feature. Marvelous! The NASA page doesn’t say which astronaut took the image. Click the image for a larger, non-annotated view. And here’s a video I found of an orbital sunrise taken in 2006 on the STS-116 space shuttle mission. I loved the time that Soichi spent on orbit as it was like a friend was up there, taking pictures and keeping us posted of the marvels they see from ISS in a less official, corporate-like fashion. I am more than happy that Doug Wheelock will continue on the same path. It may be also a direction from the NASA PR to go this way, and we may see in future more astronauts on the ISS keeping the twits from the orbit, as Soichi had thousands on followers on his posts, and may have been much more efficient on promoting the ISS and NASA (and JAXA of course) than tens of thousands dollar worth of banners, commercials and web sites.